This quality T-shirt is available in either Black, White, or Ash (call regarding availability of other colors). 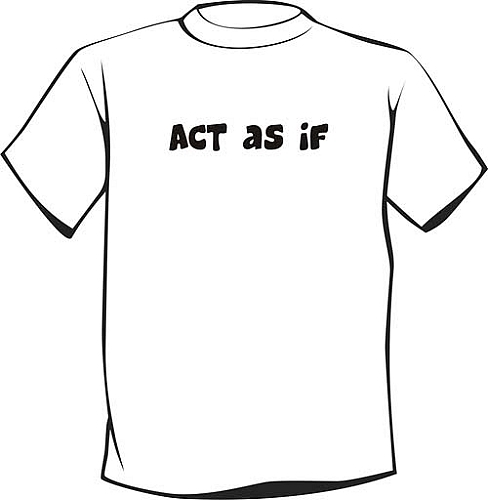 The front of the T-Shirt displays "Act As If." Quality matters when it comes to your Recovery T-Shirts! We use only premium quality 6.1 ounce heavyweight preshrunk 100% cotton T-Shirts. * All Recovery T-shirts are taped shoulder to shoulder, and are double needle hemmed for long-lasting durability. Nothing but the best for you! This Recovery Tshirt will make a perfect gift for friends, family members, sponsees, sponsors... or, what the heck? Keep one for yourself!